Check out our Design Services. I've had this particular clematis in my garden for about 8 or 9 years. It has rambled over and covered the railing of my back deck. It has required no additional care and as of this year, has never been pruned. This fully evergreen vine has laurel-shaped leaflets about 5+/- inches long and fragrant 2-3 inch, star-shaped white flowers in late winter. The bloom time for my clematis is early to mid March. The flowers have the aroma of vanilla with the scent permeating the garden being and noticeable more than 50 feet away. Clematis armandii climbs by twining itself around objects. It has no tendrils and therefore needs an open or rough structure on which to climb. Plant Armand's clematis in full sun to partial shade. *If planted in full sun, protect the lower stem and base of the plant from the hot afternoon sun. This vine will also perform well in partial shade. The soil should be rich in organic matter, loose and well-drained. 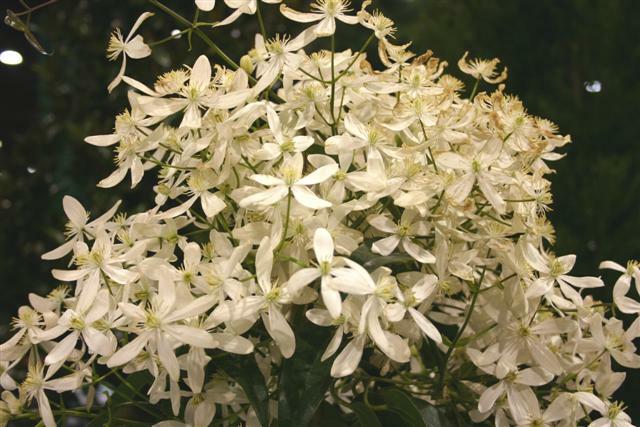 Use Armand's clematis to cover a fence, arbor, pergola or other such structure. Pruning is only needed to keep the plant in check and should be done right after it finishes flowering. I've had no pest or disease problems with this plant and it doesn't appear to be attacked by deer. This plant is widely available at most retail nurseries. Make sure to support our local nurseries during this time of crisis brought on by the severe drought.